For the historic hotel and casino, see Sands Hotel. Las Vegas Sands Corporation is an American casino and resort company based in Paradise, Nevada, United States. Its resorts feature accommodations, gaming and entertainment, convention and exhibition facilities, restaurants and clubs, as well as an art and science museum in Singapore. In Asia, the Marina Bay Sands located in Singapore is the most recent addition to the company's portfolio. Through its majority-owned subsidiary Sands China, the company owns several properties in Macau, including the Sands Macao, Sands Cotai Central, The Venetian Macao, The Plaza Macao, Four Seasons Hotel Macao, and The Parisian Macao. It is the largest casino company worldwide. Entrepreneur Sheldon Adelson and his partners Richard Katzeff, Irwin Chafetz, Ted Cutler, and Jordan Shapiro bought the famous Sands Hotel in 1989. They opened the Sands Expo and Convention Center across from the hotel in 1990. The 1.2-million-square-foot center is currently the largest privately owned convention facility in the world. The Sands Hotel was having trouble competing with the newer resorts on the Las Vegas Strip, Adelson imploded it to make room for The Venetian. Construction of the Venetian began in 1997, when themed hotels were the fashion. Modeled on Venice, Italy, it joined Excalibur, New York-New York, Paris Las Vegas and other themed hotels on the Las Vegas Strip. When the trend in Las Vegas then shifted to more understated and "elegant" hotels, construction on The Palazzo began in 2005. Together, the Palazzo, Venetian and Sands Expo make up the world’s largest integrated resort, with 7,100 all-suite rooms, 2.3 million square feet of convention and exhibition space, and an array of shopping, dining and entertainment options. Adelson got his start through the trade show business. As early as the 1970s, he saw the potential in personal computers. He and his partners founded the computer trade show COMDEX in 1979. They then sold it in 1995 for more than $800 million. In 2004, Adelson took the Venetian's parent company public: Las Vegas Sands Inc. became Las Vegas Sands Corp.
Perhaps because of his start in the trade show business, Adelson focused his hotel efforts on courting the convention and trade show industry. At the time, when other hotels were focusing on gambling, his approach was considered unorthodox: the traditional strategy was to keep hotel rooms minimal, so as to encourage guests to spend as much time as possible in the casino. Adelson, however, had all his hotel rooms made into luxury suites; he put in mini-bars and big screen televisions; and he created comfortable work spaces in every room. By doing all this, he counted on business from the Sands Expo and Convention Center to keep mid-week occupancy strong. This proved correct; the company now makes more money in Las Vegas from conventions than gambling. And Adelson's convention-centered approach is no longer considered unorthodox, but rather the paradigm in the hospitality industry in Las Vegas. Adelson was also among the first to foresee the financial potential of Asia. Before his American competitors, he made the move to locate his company nearer to the Asian market. Macau, the former Portuguese colony handed over to China on 20 December 1999, is the only Special Administrative Region right next to mainland China where casino gambling is legal. Las Vegas Sands opened the Sands Macao in 2004. Adelson next saw that 1 billion people are within a three-hour flight of Macau, and around 3 billion people are estimated to live within a five-hour flight. He realized that his company's future was in creating not one hotel, but establishing an entire strip - a Las Vegas-like Boulevard in Macau featuring many hotels of various styles and price ranges. There were physical challenges to his idea: the total area of the small peninsula and two islands that make up Macao is less than 12 square miles; this area is densely populated; and, at the time, there was no land for such a large strip. So Adelson created the land: he had his company fill the bay between the Coloane and Taipa islands. He called the area the Cotai Strip. He then began construction of the largest inhabited building in the world - the Venetian Macao. To ensure the structure was stable, 13,500 steel piles were driven into the bedrock below. At peak times, 15,000 people were working on the construction site. Adelson set a three-year time limit for construction. This meant building needed to take place at a rapid pace, but the building was finished on time. The hotel officially opened at 7:18 p.m. on August 28, 2007 -a time that was believed to have good feng shui. The resort is twice the size of its Las Vegas counterpart, with an arena that will seat 15,000 people and one of the largest exhibition centers in Asia. The resort receives between 70,000 and 100,000 visitors each day and has a staff of approximately 12,000 on site. The 550,000-square-foot casino is also the largest in the world. 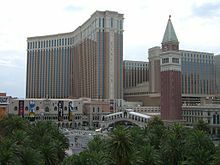 In 2008, Las Vegas Sands opened a Four Seasons hotel next to the Venetian Macao, as well as Paiza Mansions, which are "for invited guests only". The company is also building resorts in Macau for a number of brands - The Holiday Inn, Intercontinental, and Sheraton Hotel - when they open on the Sands Cotai Central in the first quarter of 2012. Despite its successes, Las Vegas Sands hit hard times in 2008 during the financial crises. At one a point the company was losing $1,000 per second. The stock price fell 97 percent within a 52-week period. To stop the bleeding, Adelson loaned the company $1billion of his own money. He also continued with plans to build a $5.6 billion resort, Marina Bay Sands, in Singapore. Given the financial difficulties the company was facing, there was skepticism about the decision to build the Marina Bay Sands. However, Adelson argued that, with only one other competitor in Singapore, opening the resort would prove profitable. After it opened at the end of April, 2010, it posted a $600 million operating profit in the first eight months of business, a record in the industry. The Marina Bay Sands has three 55-story towers with approximately 2,600 rooms and suites. Atop the hotel is the Sands SkyPark, a park that is set on top of the three towers. The park has vegetation, an observation deck, several restaurants, and a swimming pool that seems to flow over the building. The resort's location right next to the city center allows it to serve as an entertainment site for the local population and also a destination for business travelers and MICE (Meetings, Incentive, Convention, Exhibition) events. A year after Marina Bay Sands opened, tourism to Singapore shot up 20% and the economy expanded by 15%. Las Vegas Sands continues to look for new expansion opportunities. It is keeping an eye on countries such as Japan, Korea, Vietnam, Taiwan and Thailand. In the US, the company continues to expand its 2009 resort in Bethlehem, Pennsylvania, which opened in 2009 to compete with Atlantic City for some of the New York-area market. Las Vegas Sands has also talked about the possibility of a Florida resort. In Europe, Adelson and his management team were in discussions with governments in Madrid and Barcelona. In September 2012, Las Vegas Sands Corp. announced Madrid had been chosen as the destination for the gambling resort project dubbed Eurovegas. More precisely, in February 2013 it was reported the town of Alcorcón, in the outskirts of the Spanish capital had been chosen as the site for the "EuroVegas" project. It was expected to take about ten years to build six casinos, twelve hotels, a convention center, three golf courses, shopping centers, bars and restaurants. However, in December 2013 the Eurovegas project was officially canceled and it will not be established anywhere in Europe. In Q1 2015, the company proposed the 65,000-seat Las Vegas Raiders Stadium for the Oakland Raiders football team. The total cost would be an estimated $1.2 billion, and the stadium would be located near the Las Vegas Strip and UNLV. It would be co-developed with City of Industry, California-based Majestic Realty Co. The proposal required $420 million from private investors and $780 million in public funding, with benefits from tourism. In March 2018, the company agreed to sell Sands Bethlehem to the Poarch Band of Creek Indians of Alabama for $1.3 billion. For the fiscal year 2017, Las Vegas Sands reported earnings of US$2.806 billion, with an annual revenue of US$12.882 billion, an increase of 12.9% over the previous fiscal cycle. Las Vegas Sands shares traded at over $58 per share, and its market capitalization was valued at over US$41.1 billion in October 2018. According to the Center for Responsive Politics, Las Vegas Sands was the #1 contributor to federal campaigns during the 2012 election cycle, donating $52.9 million, 100% to Republicans. By comparison, during that same period #2 Adelson Drug Clinic contributed $42.1 million, 100% to Republicans, and #21 Goldman Sachs donated $8.9 million, 77% to Republicans. Since 1992, Las Vegas Sands has contributed $70.5 million to federal campaigns, and since 1999 has spent $5.4 million on lobbying. Las Vegas Sands also owns the Four Seasons Hotel Macao, Conrad Macao, Holiday Inn Macao, Sheraton Macao and The St. Regis Macao at Cotai Strip, Macau. Sands Hotel and Casino Las Vegas, Nevada December 15, 1952 June 30, 1996 The original Sands Hotel in Las Vegas - demolished on November 26, 1996. In 2012, CEO Sheldon Adelson and his family owned approximately 53% of the company. In December 2004, the company completed its initial public offering with the ticker LVS on the New York Stock Exchange at a price of $29 per share. Only 6.8 percent of Las Vegas Sands was put on the market. Adelson maintained 87.9 percent ownership of the company, while its management and directors owned the remaining 5.3 percent. In October 2007, the company's market capitalization peaked at $52 billion at $144.56 a share. However, because of general market declines and overall concern of the short-term financial health of the gambling industry, the market capitalization sank to approximately $1 billion at less than $2 a share by March 2009. On September 30, 2008, with the company stock trading at $36.11, Adelson and his wife, Dr. Miriam Adelson, invested $475 million in the company through a 6.5% convertible note due in 2013. Subsequent to the $475 million investment by the Adelson family, and due to a further deterioration of the global economic environment, on November 11, 2008, the company announced that it will be receiving an additional investment of $525 million from Adelson and his family along with a raising an additional $1 billion in a secondary offering. The Adelsons agreed to buy 5.25 million shares of preferred stock and warrants to purchase about 87.5 million shares of common stock at an exercise price of $6 each. In November 2009, the company completed an initial public offering of Sands China Ltd., its subsidiary that owns and operated its Macau properties, and raised a total of $3.3 billion in equity capital by selling a 29% interest in Sands China Ltd.
Las Vegas Sands Corp. operates 17 luxury jets, used primarily for transportation of the company's executive officers and VIP guests of its properties. Most of the aircraft in the Las Vegas Sands fleet are owned by and registered to Las Vegas Sands Corp., and a few are registered to Interface Operations, LLC, a Massachusetts-based company owned by Sands CEO Sheldon Adelson. Three of the Interface Operations, LLC aircraft—a Boeing 737-700, Gulfstream III and Gulfstream IV—are on lease from Yona Aviation, LLC. Sands' two Boeing 747SP aircraft are registered to Interface Operations Bermuda, LTD.
All operational Las Vegas Sands aircraft are based in Las Vegas McCarran International Airport. In March 2013, media reports claimed that Las Vegas Sands informed the U.S. Securities and Exchange Commission that it had likely violated federal law against bribery of foreign officials. The company fired back at these reports, stating in a press release: "The company did not report any violations of the anti-bribery provisions of the FCPA and it said news reports stating otherwise, such as the headline in today's New York Times which described the matter by saying 'Casino Says it Likely Cheated,' are both inflammatory and defamatory." The company claimed that what it reported was that "in its preliminary findings the company's Audit Committee had advised that there were 'likely violations' of the books and records and internal controls provisions (i.e. 'accounting provisions') of the FCPA. A potential violation of the accounting provisions could range anywhere from a single transaction recorded incorrectly to other errors in the accounting records. The company said it will vigorously defend itself against that type of uninformed and misleading reporting." On May 31, 2016, Sands reached an undisclosed financial settlement with former Sands China president Steve Jacobs, who sued the company in 2010 for breach of contract and wrongful termination. Terms of the settlement weren’t disclosed, but the Wall Street Journal reported that the company paid Jacobs “more than $75 million.” Jacobs had claimed he was dismissed for “blowing the whistle on improprieties” in Macau, including Jacobs’ allegations that Adelson had instructed him to investigate the financial and business affairs of senior Macau officials to obtain damaging information to use as leverage in future regulatory discussions. Adelson denied these allegations, characterizing Jacobs as a disgruntled ex-employee. ^ McDonald, Duff (8 February 2012). "Meet the woman behind Sheldon Adelson". Retrieved 2017-09-14. ^ a b c d Stutz, Howard (16 December 2004). "Investors, Las Vegas Sands hit jackpot as stock goes public". Las Vegas Review-Journal. Archived from the original on 18 December 2004. ^ "Coffee With Mike". Las Vegas Sands Blog. 24 April 2011. ^ Puvaneswary, S (July 4, 2012). "Las Vegas Sands eyes South Korea IR". TTGmice. Archived from the original on 2014-02-28. Retrieved 10 October 2012. ^ "Las Vegas Sands Names Madrid As Preferred Location for European Development". Las Vegas Sands. 7 September 2012. Archived from the original on 11 September 2012. ^ a b Stutz, Howard (January 28, 2016). "Las Vegas Sands proposes $1B domed stadium; Adelson to meet with Raiders owner". Las Vegas Review-Journal. ^ "Las Vegas Sands Corp. - Financial Info - Annual Reports". investor.sands.com. Retrieved 2018-11-07. ^ a b "Top Organization Contributors". OpenSecrets.org. Center for Responsive Politics. Retrieved 9 June 2016. ^ "Organizations: Las Vegas Sands". OpenSecrets.org. Center for Responsive Politics. Retrieved 9 June 2016. ^ "Global Airline Guide 2016 (Part Two)". Airliner World (November 2016): 39. ^ Schwirtz, Michael (March 2, 2013). "In Filing, Casino Operator Admits Likely Violation of an Antibribery Law". The New York Times. ^ Master, Farah (1 June 2016). "Las Vegas Sands settles with former CEO of Macau casino unit". Reuters. Retrieved 15 March 2019. ^ O’Keeffe, Kate; Berzon, Alexandra (1 June 2016). "Las Vegas Sands to Pay More Than $75 Million to Settle Suit Filed by Former Macau CEO". Wall Street Journal. Retrieved 15 March 2019. ^ Velotta, Richard N. (1 June 2016). "Las Vegas Sands Corp., Steven Jacobs reach confidential settlement in wrongful termination case". Las Vegas Review-Journal. Retrieved 15 March 2019. ^ Heuer, Mike (2 June 2016). "Adelson & Sands Will Pay Ex-CEO Millions". Courthouse News Service. Retrieved 15 March 2019. ^ Isaacs, Matt. "Megadonor Sheldon Adelson and the inside story of Chinese casino money flooding our elections". Mother Jones. Retrieved 15 March 2019. ^ Velotta, Richard N. (5 March 2019). "Judge: Adelson doesn't have to testify in Macau licensing case". Las Vegas Review-Journal. Retrieved 15 March 2019. ^ Ritter, Ken. "Vegas Sands-Macau dealmaker settle 15-year case". Lehigh Valley Business Cycle. Retrieved 15 March 2019.